Our lab is excited to welcome Ross Vander Vorste, PhD, as a new post-doctoral research associate. Ross is a freshwater ecologist with a wide-range of experience studying small streams, large rivers, isolated wetlands and glacial lakes. Ross completed his PhD in Ecology with Dr. Thibault Datry in December 2015 from the University of Claude Bernard in Lyon, France. During his PhD, Ross studied how surface water drying in rivers affects macroinvertebrate community structure and ecosystem functioning. He earned his Master’s Degree with Dr. Nels Troelstrup Jr. in 2010 in Biological Sciences from South Dakota State University (SDSU) where he studied macroinvertebrate communities, habitat and water quality in intermittent headwater streams across eastern South Dakota. Ross received his Bachelor’s Degree in Environmental Management from SDSU in 2006. Ross has also worked as an Environmental Scientist for the Department of Environmental and Natural Resources in Raleigh, North Carolina. 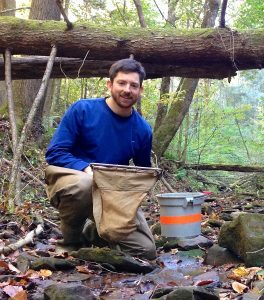 At Virginia Tech, Ross is working on an Office of Surface Mining project to study the process of leaf litter decomposition, a key carbon-processing function, in headwater streams affected by coal-mining activities in the Appalachian region of the USA. His work will involve quantifying leaf litter decomposition as well as macroinvertebrate and microbial diversity across 24 headwater streams with the goal of determining the influence of mining-induced salinity on leaf litter decomposition.